As I write this, my NaNoWriMo countdown clock shows just 13 days separate me from the start of temporary madness. Mise en scene, mise en place, mise en esprit — you name it, I’m arranging it. 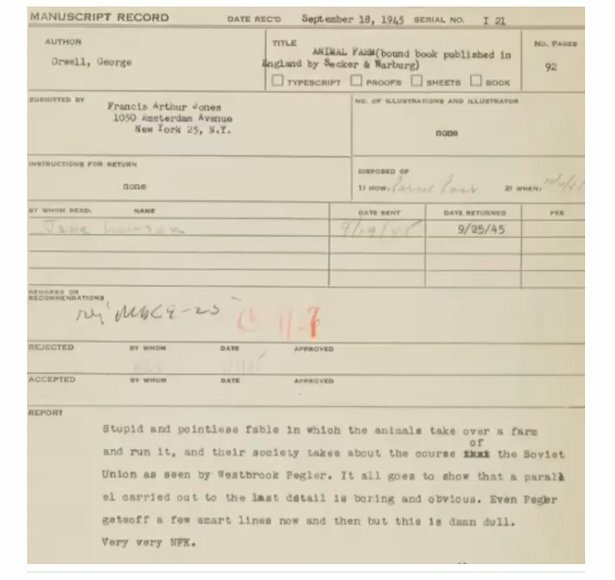 Rejection letter for Orwell’s Animal Farm. For mise en esprit, I take comfort from Kate DiCamillo’s talk at this past weekend’s USBBY conference here in NYC. She explained that whenever she visits schools, she talks about rejection letters. Her first challenge to the students is for them to guess how many times her first book was rejected. They always start with “three”, she said, and rarely guess more than “ten”. The “right” answer is 477. If she’d given up after 200 rejections, she explained, that would have been the end of her writing career. Even if both figures are exaggerations (DiCamillo later said she had revised one of her books 7,222 times), they provide a sense of her determination, of her faith that this was something she was meant to do, and of her belief in the value of her story. And so, rejection letters (these days, they’re emails) may continue to arrive in my virtual mailbox, but my esprit recovers. And there’s always the curiosity about how the next story will play out. Now I just need to take care of mise en scene and mise en place.